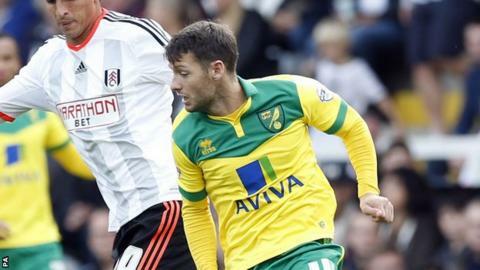 Norwich City midfielder Wes Hoolahan has suffered ankle ligament damage. "He's not so good. He's got ankle ligament damage. We're still assessing how bad," boss Neil Adams told BBC Radio Norfolk. "We've had the scan and need to speak to people about how we manage him." Hoolahan is Norwich's longest-serving player and has featured 12 times this season. "He's as good a finisher as we've got. He's a player I want here. "If there are genuine enquiries, they will be politely declined." He played in the Republic of Ireland's 7-0 win over Gibraltar and 1-1 draw with Germany earlier this month. "He's struggling with it at the minute. But we're hoping it's not as bad as first feared," said Adams. "He felt much better the next day than he thought he would do. In the next couple of days we'll be able to put a timescale on it." Meanwhile, Adams says last season's top scorer Gary Hooper will not be joining Bolton Wanderers. Hooper made his first Championship appearance of the season at the weekend following a calf injury and has been linked with a loan move to rejoin his former Celtic boss Neil Lennon. "He's as good a finisher as we've got. He's a player I want here," said Adams. "If there are genuine enquiries they will be politely declined."